Working in the factory, fishery, agriculture, gardening, do-it-yourself water in household, laundry and cleaning, etc. Products considered to be good for cooking work It is a time to wear a glove inside. Because cloth is not applied to the lining, there is a possibility that the summer may be steamed. This review is about item#36308885. It is used for house cleaning cleaning work. Because it is strong against chemicals and easy to use, I always use it. Since there are many cases where a hole or a crack enters the fingertip, I think that it becomes easier to use even if you reinforce your fingertip a little more. It is thick and durable. It is hard to break. I always use Kore because I use a detergent for business. 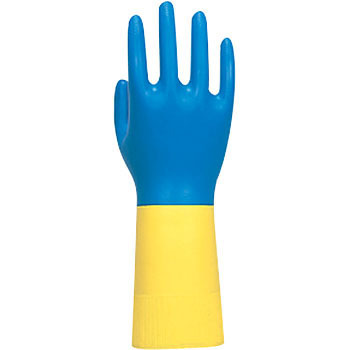 PVC Thin Gloves, "Blue Fit"